Barney’s storyboard case for River of Fundament in the entrance to his show at the Morgan. Photo: Graham S. Haber. 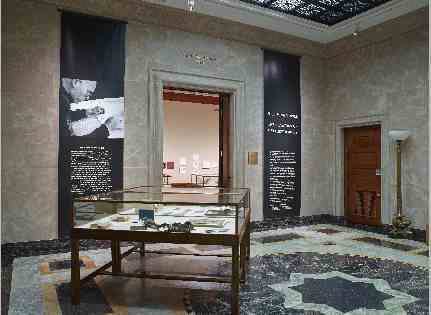 Courtesy: Matthew Barney, Morgan Library. The brilliant, perplexing, and mysterious Matthew Barney has combed through the Morgan’s collection to curate mini-collections for the first-ever retrospective of his drawings — Subliming Vessel: The Drawings of Matthew Barney (on view through September 8). Whether you enjoy his work or not, you can’t deny that he and his curators did a bang-up job of presenting his works-on-paper. Get over to enjoy highlights of the Morgan’s collection in an entirely new way – a mash-up of controversial contemporary work with infrequently seen gems, many collected by J.P. himself. 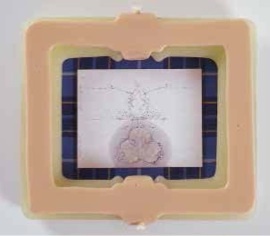 Graphite, lacquer, and petroleum jelly on paper framed in cast epoxy, prosthetic plastic, and Manx tartan. Source: Private collection. 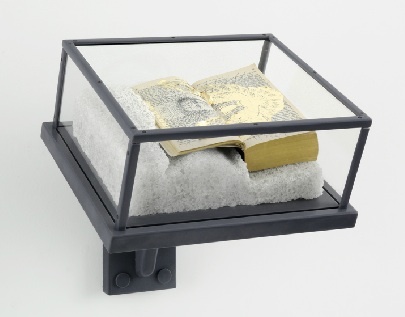 Courtesy: Matthew Barney, Gladstone Gallery. There’s real fun to be had by examining the flat waist-high cases in chronological order (clue: they are marked with the letters A to O). Your walk will take you through Barney’s storyboards for his early works, through Cremaster, and to his current project – River of Fundament, a seven-act opera combining film and live performance. The cases contain stuff from the Morgan Library interspersed with the props, photos, drawings, and other images that inspired Barney’s extravaganzas. In order to enjoy this to the max, take a guidebook (in a stack right inside the gallery door). Even if you’re a Barney connoisseur, you’ll need the gallery guide to ID the great picks from the Library. Case C is very satisfying to anyone who’s followed Barney’s career from his satyr-prancing videos at his first Biennials – you’ll see an 18th-century satyr drawing from Italy and the 1290 Persian blockbuster, The Benefits of Animals, opened right to the page with two crazy mountain goats. (And, yes, they’re standing in trees!). Cases K-O contain the River of Fundament storyboards, which were inspired by Norman Mailer’s book, Ancient Evenings, Egyptian reincarnation myths, and the Chrysler bankruptcy. Alongside Barney’s props and things, you’ll glimpse sky burials documented by Curtis, Whitman’s original Leaves of Grass, and a Diane Arbus portrait of Mailer. Look at the slide show from the exhibition, but know that Barney’s drawings are best enjoyed in person. They’re tiny, detailed, and often disturbing. With many references to Egyptian deities, Renaissance drawings, and cars, each is a tiny world unto itself. Will you ever understand what those iconic self-lubricating frames are about? It doesn’t matter. It’s just nice to dive into an alternate, mysterious universe and simply swim around in Barney’s non-linear excavation of similarly provocative illuminations and page-turners from Mr. Morgan’s stacks. This entry was posted in Art, Museums and tagged art, drawing, museums, photography by mssusanb. Bookmark the permalink.